BAGHDAD, Iraq (CNN) -- Seven members of an exiled Iranian opposition group have been killed in clashes with Iraqi police at a refugee camp over the past two days, authorities said Wednesday. A woman protests the takeover of Camp Ashraf by Iraqi forces in front of the White House on Wednesday. Security forces attempted to establish security control at Camp Ashraf in Iraq's Diyala province Tuesday and continued Wednesday to square off with members of the People's Mujahedeen Organization of Iran. The camp, which has housed Iranians since the mid-1980s, has been a refuge of the People's Mujahedeen. Regarded as a terrorist group by the United States and Iran, the group allied with Saddam Hussein in Iraq during the 1980s with the goal of toppling the Iranian regime. Since Hussein's overthrow in 2003, Iraq has established good relations with the Iranian government. Iran wants to see the camp shut down, and the Iraqi government has said it would close the facility after it got control of the camp from the United States this year. 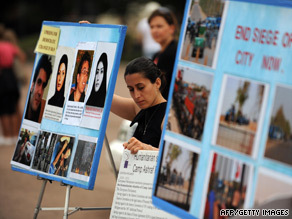 Residents in the camp are concerned about being forcibly turned over to Iran. People there said they would be willing to go back to Iran but only if there are assurances that its members won't be mistreated. An Interior Ministry official said that nearly 100 other People's Mujahedeen members and 45 police officers have been wounded. Maj. Ibrahim Abdullah, riot control commander in Diyala province, said that hundreds of People's Mujahedeen members fiercely resisted security forces as they tried to enter the camp, using stones, knives and sharp tools to fight them. Abdullah himself had been wounded and spoke from a hospital in Baqouba. People's Mujahedeen is the largest member of the National Council of Resistance to Iran, an umbrella group of Iranian opposition organizations. The secretariat of the council also confirmed seven deaths since Iraqi forces raided the camp Tuesday. It said Iraqi forces wielding machine guns "opened fire on the defenseless residents" of the camp Wednesday. It said Iraqis "demolished all facilities, bungalows and residences" at the camp's northern wing. The council said camp residents have been shouting "Allahu Akbar," which means "God is great." "For what reason were they killed?" the people chanted. On Tuesday, the council accused the Iraqi police officers of firing pepper gas and beating the refugees while demolishing the walls and fences around the camp. About 3,500 people live at Camp Ashraf, most of them members of the People's Mujahedeen for about 25 years after fleeing Iran. Also known as Mujahedeen-e-Khalq, the People's Mujahedeen Organization of Iran was formed to oppose the shah of Iran but fell out of favor with the Islamic Revolution of Ayatollah Ruhollah Khomeini after 1979. People's Mujahedeen, an Islamist group that promotes a Marxist government for Iran, for years waged a violent campaign against the fundamentalist Islamic Tehran government, including bombings that killed politicians, judges and Cabinet members.